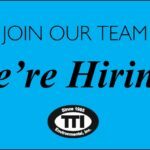 Environmental Consultant | TTI Environmental, Inc.
TTI Environmental Inc. is seeking a motivated individual to fill an available position as Environmental Associate 1 in the Environmental Consulting Division of TTI’s Moorestown, NJ office. This position is entry level to 3 years of experience in Phase I/II Environmental Site Assessments. Industrial Hygiene experience in Asbestos, Lead or IAQ is a plus.